WINTER UNAVAILABLE OWNER OCCUPIED On Barbados' beautifully flowered and treed west coast,and located in Holetown, St.James, this lovely upper-level, one-bedroom condominium is beachfront with beautiful views over the Caribbean,both by day and night. It has a fully equipped,custom fitted renovated kitchen,with gas stove and electronic ignition. A spacious living/diningroom area opens out to the comfortably furnished balcony overlooking the beach,offering 'magical' sunsets every evening provided by Mother Nature. The bedroom has a king-size or two twin beds, with a split system airconditioner, with remote control. The condominium complex is well situated in the path of the Tradewinds, allowing optimization of cross-ventilation for interior cooling as the condo has lockable wrought iron gates front and back, plus with the added comfort of air conditioning in the bedroom for extra sleeping comfort. The livingroom has convertible sofas which can also be used for sleeping an extra family member,as they make up into single beds.There is WiFi & hi speed DSL 4G internet access and phone making communication simple. The dining area comfortably seats 5. The full bathroom has a separate vanity with granite counter top, dressing area with mirrors and hairdryer, plus ample storage space and security chest for safe keeping of documents,valuables Condo has its own hot watersystem so there is never a shortage of hot water,(plus water is drinkable right out of the tap, as Barbados has some of the best water in the world!) There are portable fans,celing fans, airconditioning, cable TVs,DVD,phones, highspeed DSL 4G WiFi internet access, microwave, coffee maker,blender,all linens dishes and glasses . There is off street parking available and as the complex is not on the main road - No traffic noise. The tropical garden providing a luxuriant oasis for relaxation, has wifi plus it has a freshwater pool, freshwater shower and lounge chairs, umbrellas,and is beachside - the sea, just a few steps away. Sunbed mattresses are stored in the condo for extra comfort along with some extra light weight aluminum chairs .The beach is safe for swimming, and there is a manmade reef with a huge variety of marine life very close into the shore - so snorkeling off the beach is easy - water sports available on the beach and it`s an easy few minute stroll to a beach bar -which has a steel band for happy hour on a Sunday, or the shopping centre, from which buses run every few minutes into the city centre or to places of interest. All beaches are public. There are banks,car hire, taxis, and local inexpensive buses into Bridgetown, and 'tourist attractions' which are used by both visitors and local alike. Holetown is 28 km from the airport, is home to many fashionable restaurants, and the upscale new Lime Grove mall. Dining and shopping are within easy walking distance, and many watersports are available on the beach at your doorstep. The nextdoor hotel plays music in the evening until 10.30 pm so one can sit and enjoy that free! There are also a couple of nightclubs and late night bars near by, and a slots bar for those who like to `gamble`a little! , plus a new dine-in cinema! in the Limegrove Lifestyle centre, for evening entertainment. Dine at one of the 50 best restaurants in the world! - The Cliff -reservations are required. Plus the famous Sandy Lane Hotel, one of the most luxurious, and upmarket hotels worldwide, popular with the rich and famous, is just a 10 minute drive away. Holetown also has numerous bars and restaurants, ranging from fast food to bistros, and gourmet dining, and many restaurants also provide 'take out'. Plus there are street vans and stands around the area, good inexpensive food - (safe to eat)! and water is drinkable out of the tap! Barbados offers an opportunity to experience a Caribbean lifestyle influenced by its traditional British history.The first settlers arrived in1627, and the island still retains its British Parliamentary system. It has a reliable infrastructure, and offers the comforts and safety of most Western countries. Since the island is roughly triangular in shape, the 3 coasts offer a totally different ambience. The east coast bordered by the Atlantic ocean, is wild, rugged, beautiful, isolated, and unsuitable for swimming in most areas. The south coast, has heavy surf, and is more industrial, commerical, and has numerous fast food outlets, and local markets. The west coast, known internationally as the Platinum Coast,borders the blue Caribbean Sea, which is normally calm and suitable for all varieties of water sports. As Barbados lies outside the hurricane belt, usual weather is blue sunny skies and white puffy clouds, normal showers being of short duration. Average daily high 30C. Sea temperature's a constant 80F. We are a retired couple who have been spending our winters here for the past 26 years, we live the rest of the year in Canada. We love Barbados, the friendly people, the great climate, ('hurricanes hardly happen' - last one was more than 50 years ago) - the ease of living here. Everything we need is close by, including gourmet take out, home baked bread, croissants etc. Restaurants when ever we wish to eat out, - a life style without troubles! Purchasing this condo was a 'love at first sight' property - fabulous panoramic view, easy walkable proximity to shops, restaurants, beach, on our doorstep, garden,pool- good security, good island infrastructure, and drinkable water out of the tap!! stable economy and reliable banking, friendly people, -a unique, once in a lifetime opportunity! We'd been staying in hotels on the island since 1975, and came to realize that there was no other place on earth which offered all that Barbados could provide. It seemed beyond crazy to ignore the once in a once in a lifetime opportunity that came along when we found our condo winter home. We realized that if we didn't purchase it there and then, we would regret it for the rest of our lives! So we've live there happily ever since and only return to Canada when the weather warms up! The Best Panoramic View on the west coast !! Easy access (4 min. walk)to stores, bars, restaurants, banks, , etc.- NOT on the main road so NO constant traffic noise -(there is a hotel next door which plays music between 8.00pm- 10-.30pm ) Instant access to the beach - which is only 10 feet away, I walk 4 miles on the beach every morning! - garden with pool plus sun and shade with trees,flowers, umbrellas, garden furniture. - Safety. features galore !- Easy access (4 min. walk) bank, to bus into city, or taxis, or car hire. Supermarket will even deliver groceries. (2) two lines - allowing for hi speed DSL computer use at same time as phone in use. Gas stove has electric ignition stove top - so no matches needed to light the burners! automatic coffee maker,& filters - or if preferred there is also a cafetiere - plus tea pots etc. salt, pepper, spices, paper towels etc. Ample Dishes and utensils for 6 - plus all necessary glassware, pyrex dishes, serving dishes, including plastic dishes and drinking glasses for use around the pool area. Golf is available at nearby hotels such as Sandy Lane Hotel and Royal Westmoreland. There are two or more other courses further away. Ceiling Fans, portable table fans, tower fan, Hair Dryer, DVD player, books, games, - excellent security features include grills, security chest, bars for locking sliding glass doors, exterior security lighting etc., security cameras in parking lot - anything that is not mentioned - ask our resident manager 'Pat: and she will see if it is available for you. She is also a fount of information, and can let you know about most things on the island etc. If like us you are looking for the perfect spot to relax and unwind then this is definitely the place to go. In fact, it was probably the most relaxing holiday we have had for a very long time. The apartment has everything you could possibly need, we cooked in the apartment for 4 nights and ate on the balcony taking in the amazing vista and awesome sunsets, we swam 3-4 times a day in the ocean (less than 1 minute walk from the apartment) and the lovely pool which is surrounded by tropical gardens with humming birds and mongooses, very amusing to see Pat's cat Whisky play chasing the mongooses! There are numerous bars and restaurants within a 5-10 minute walk and a great supermarket to buy anything you might need. We left feeling totally chilled and relaxed, what more can you ask from a holiday ! Thank you Dayle, George, Pat, Chris, Ros, Julia and not forgetting Whisky! I have stayed in hotels and apartments all over Barbados and never stayed in the same place twice - but now I’ve found this absolute gem I will never stay anywhere else again. It really is the perfect home from home, in what is possibly the best location in Barbados. A very short walk to shops, bars and restaurants but also tucked away in a quiet corner right on one of the best beaches on the island. There is even a super house reef with resident turtle, stingray and octopus! The sunsets are incredible and can be watched from the balcony (best view), beach or the very peaceful pool in the beautifully maintained gardens. The owners and manager could not have been more friendly and helpful, and we are already planning when to return next year. What a wonderful review of our winter home..... Thank you so much for taking the time to write, and share your holiday experiences with future guests. We also spend many happy hours watching the fabulous sunsets every night, and never of Mother Nature's spectacular light show. We look forward to welcoming you back next year, so that you can feel that our home is Your home.too. thanks again for writing - it is very much appreciated. A great service from the owners from initial enquiry to the end of the holiday. The local support team for the Condo are not intrusive but are at hand if required. Many great restaurants within minutes walk. Thank you so much your kindness in taking the time from your busy schedule to write a such a nice review of our winter home. It is so reassuring for future visitors to hear directly from past guests that the property is as advertised. We are most appreciative of your sharing your holiday experience with others. We too spend many happy hours on our balcony watching the glorious Bajan sunsets, and the marvelous light show which follows, when Mother Nature turns the sky such wonderful colours before darkness finally falls, and the moon makes a glittering pathway in the sea. We're so pleased that you enjoyed your holiday in our home, and we look forward to welcoming you back at some future date if another Barbados holiday is on your agenda. Thank you again for writing - it is very much appreciated. Thank you Jeff for sharing your vacation/ honeymoon experience with future guests. We are so glad that you found our website factual as we really believe in "truth in advertising"! Very pleased to hear that our taxi man was able to meet your flight and get you safely installed in our home.... we are blessed to have such a helpful support team. Thank you for taking the time from your busy schedule to write this helpful review of our home --- it is much appreciated. This was a return visit to Palm Beach but our first stay in #1 right on the beach front. 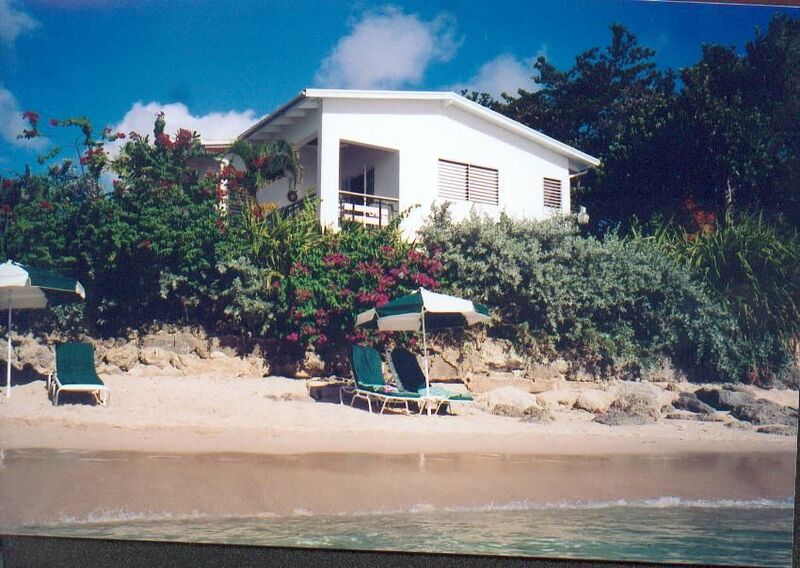 The Condos are perfectly positioned to enjoy the beautiful beach,lovely quiet pool and all Holetown has to offer. The small reef has created a perfect swimming area and protects the beach with its lovely sandy bays and boardwalks to explore. The owners are proud to share their "Winter home" and have provided everything necessary for a perfect stay. Communication was prompt and a pleasure with warm welcomes from Pat and the team as always. Thank you Pat for all the "extras"it was great to be back! Thank you Dayle and George for the pleasure of using you home ! What a lovely review of our winter home Jan, thank you for finding the time to share your comments with future guests. It is so reassuring for other visitors to read your impressions of our home and the condo complex. We are so blessed to have Pat and the rest of the "team" to ensure our guests have everything they need to fully enjoy their holiday, even though we are miles away! So glad you enjoyed the stunning view from our balcony, we still experience that "Ahh" Moment when we see it again, even after all these years! We, and all the owners, look forward to welcoming you back at some future time for another Barbados stay and in the meantime, thank you once again for writing --- it is very much appreciated. #1 is a terrific condo with a spectacular view!! We have just returned from an unforgettable stay at #1 Palm Beach Condominiums! #1 is a clean and comfortable apartment situated just steps from the beach and a few minutes walk, from the best restaurants and shops in Holetown! The apartment was extremely well kept and had all the towels, linens and appliances to suit our needs. What really stood out to us was the unbeatable views from the balcony!! #1 is the closest unit to the beach which made for breathtaking and unobstructed views of the water and sunsets. Not only was the location perfect but so were the people. Pat, the property manager was extremely helpful and Dayle, the owner was always reachable and very attentive to our needs! The locals were very friendly and the activities offered just outside the property were well worth it. Overall, we had a wonderful time and would not hesitate to recommend this apartment to others. You definitely cannot beat the view, the location and the wonderful hospitality!! Thank you so much for taking the time out of your extremely busy schedule to write this lovely review of our home. When we first saw the view many many years ago, we too were convinced that there was not another panorama like it anywhere else.....and we are still, after all these years, awed by the stunning vista. We are so glad you had an enjoyable vacation, and consider ourselves blessed to have a neighbour like Pat to look out for our guests well being. Thanks again , and have a wonderful summer.